THE MIRROR THING — or Dalston House, to use the correct title — has been such a success that it is causing traffic congestion in one of Hackney’s tiniest streets. 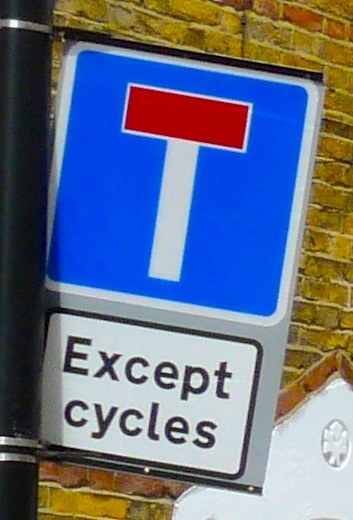 The mini-jams are caused by motorists driving into Ashwin Street from Dalston Lane and having to do U-turns as they realise that the sign, below, left, indicating no exit means, uhm, no exit. As they drive back and past the house they stop to gawp at the queues and the mirrors’ impressive effects. The queues have been developing around 11 most mornings since the school holidays started. Some motorists have driven into the dead-end street deliberately so they and their families can peer from their comfortable car seats at the mirror house, without the inconvenience and energy-expenditure of leaving their vehicles. The situation offers an opportunity to scientists wanting to test evolution theory: perhaps future generations of humans will cease to grow legs as they become redundant. * Artist Leandro Erlich’s Dalston House, a Barbican promotion, is at 1-7 Ashwin Street E8 3DL, ends Sun 4 Aug 2013. Free. For times, press Dalston House. * Emboldened underscored words in most cases indicate a hyperlink, a reader service rare on websites.